Something that I rather love about The Body Shop is that they always innovate when it come to their facial skin care, or any of their skincare products for that matter, their packaging is always really pretty and appealing and we all know their products are using ingredients that are not tested on animals, these are 3 significant points that will always attract me. 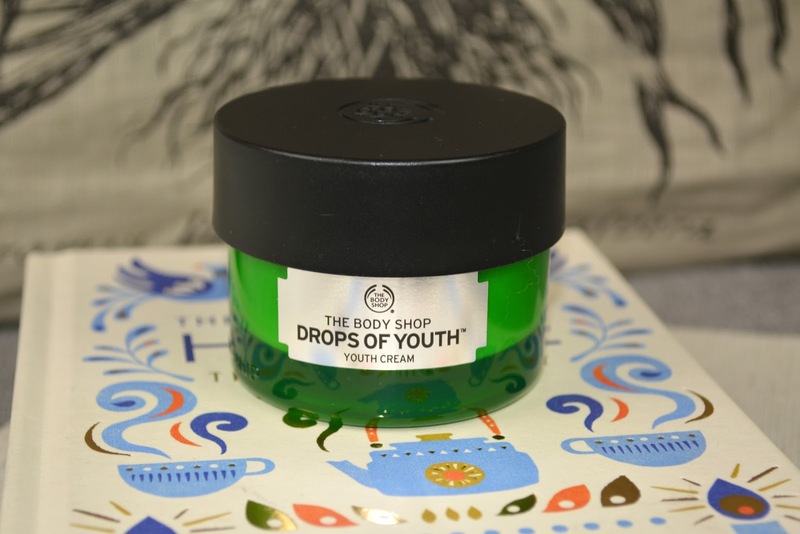 I started my 'after birth time' with a fresh new cream and I went for Drops Of Youth by Body Shop to give my skin a boost of hydration that I kind of lost during my pregnancy and especially right after the birth. I am not going to lie but what made me buy it at first was the gorgeous scent, the texture and the packaging which are the 3 magic words that I go for when I purchase any new skincare product. Drops Of Youth is a range which comes with 7 beautiful products including a Concentrate, a Peel, an Eye Concentrate, a Wonderblur, a Mask, a Lotion & a day time Cream which is there to help you tackle the first signs of ageing. Yes I am not going to pretend otherwise but I am officially 40 years old. Years have been kind...actually very kind to me but perhaps it is time to use those 'first signs of wrinkle creams' because better to prevent than being sorry, right? What's my first impression? At first it was the freshness sensation, the silky smooth air-whipped touch and the satisfaction to see my skin drinking it. Does Drops Of Youth deliver? Yes, one little word but I do mean it. Being a mum since February, sometimes I do not always have a large amount of time in the morning to get ready so for me this product is a great go to for hydration with no fuss. I do not need to think too much about it or worry about preparing my skin with other products such as serum etc. one drop of this cream and I am out the door with my two month old baby under my arm! My skin feels hydrated, the products penetrate into my skin in no time leaving nothing else but nice silky smooth skin. There is no residue that I have noticed and the scent is very mild and does disappear after few minutes. My skin feels hydrated all day long even when I wear make up. I never felt the need to re-hydrate my skin during the day which for me says it all. On top of that since using Drops Of Youth day cream I have noticed my skin being definitely more plump and definitely more hydrated. What are the good components? There are a few to say the least: Edelweiss plant stem cells, Sea Holly and Criste Marine which are ingredients known to hydrate and tighten the skin. Any bad ingredients? I must admit that one ingredient that I do not like that is included in the Drops Of Youth day cream is: alcohol. A product known to dry skin but as I haven't felt my skin going dry as such ...lets say that I have closed my eyes to it. Will I re-purchase Drops Of Youth Day Cream? Yes! The Body Shop always comes up with new ranges so I am more likely to get my hands on something new.